The traditional All Gauge Christmas Party, as usual, wrapped up the meeting year for 2018. Some 30+ attendees made it great night, capped by spectacular desserts. Once again we thank our Patron, Ryan Murphy, for his supporting grant through the Brisbane City Council. Without a clubhouse, it might have been expected that 2018 would have been a difficult, and perhaps a disappointing year. This has not been the case. Dedicated membership has been retained, and enthusiastic support for all Club activities has been much in evidence. The Carina PCYC has been our home away from home for the year, and is set to remain so until we achieve our dream of a clubhouse. We owe a great debt of gratitude to David Beard of the PCYC for his friendly and welcoming attitude towards us. Hopefully the clubhouse dream may not be only that, as through the great work done by Dennis Remmer, the possibility of the Club being re-sited to the new State Government development at the old Yeronga TAFE premises is looking extremely promising. 2020-21 could be very good years for us. During this year, while we have been without our clubhouse, members have still been able to run their trains at the homes of various members. Small groups have met regularly, and certain members have made the homes available for running to all members at certain advertised times. A Happy Christmas, and a great New Year to all our model railway operators and friends. After the flurry of activity of two Table Sales and a Public Show Day, we’re entering a quiet period, however All Gauge is still moving forward. The well-attended October members meeting at the Carina PCYC enthusiastically welcomed the news that the Club is pursuing good options for its future home. At this stage we are looking at 2020 as the timeframe for new permanent premises, but until then we continue to partner with the Carina PCYC to hold our events program and member functions. We will announce more soon on our future plans. Some photos from recent events are here https://photos.app.goo.gl/MDrC9RtJMyw1yGLp9 and here https://photos.app.goo.gl/9meqNM83a2NGAGdp9 . Members continue to run their non-DCC locos on our Midlands layout on Wednesdays at Jack Hallam’s home from 8am until noon, and DCC locos on the Bodmin Road layout at David Austin’s place on Fridays 6-9pm. Our next (and last for 2018) Members meeting will be held at the Carina PCYC hall at 1pm on Saturday 24 November. However, this is not our last function for 2018, as our annual Christmas Party will be held on Friday 7 December at the Carina PCYC hall. We welcome any membership enquiries for 2019. Please email enquiry@allgauge.org.au for more information. All Gauge has coped with its loss of premises very well. Membership is still holding up as demonstrated by the attendance at the last members meeting in early June. Our changed circumstances have led to the formation of a number of “cells’, where members meet at other member’s premises to run trains and to socialise. Jack Hallam’s invitation to all members to run trains at his house every Wednesday has been very successful. See our Gallery for pictures. Our interaction with the Carindale PCYC has been very positive, and we are grateful to Peter Beard, the PCYC manager, for his strong support. Two upcoming functions of the Club at the PCYC are the Table Sale on 22 July, organised by Ron Parker, and the Club Open Day on 19 August being coordinated by Jack Hallam. The All Gauge Model Railway Club is back in business with a Train Modellers Sale of thirty plus tables full of model trains and all the paraphernalia modellers need on Sunday July 22, 2018. And – as for 30 years with our Clubhouse Table Sales – it’s more than a sale; it will be our usual friendly, social occasion that finishes around 1pm. However as the Clem Jones Centre has bulldozed our clubhouse, the Train Modelers Sale will be at the big blue Carina P.C.Y.C. clubhouse. Entrance to the sale is from Narracott Street (off Creek Road). As you can see, good things are happening. The committee has already booked three events into the P.C.Y.C. (plus bi-monthly Members Meetings) for 2018 including a big Open-to-the-Public Model Layouts Show. The latest members meeting had a sound attendance, being held at the Carina Police Citizens Youth Club who made their hall available at modest cost. We hope to hold all future functions for 2018 at this venue. The calendar for the year will be published when all bookings are finalised; including table sales and train shows. Dates and times of members meetings are given on this website, and non-members with an interest in model railways are invited to attend; hopefully we can interest you in joining with us. The new Club Committee has met twice since the AGM in early February, and is very active in following up the possibility of negotiating arrangements for a new clubhouse; if you know of a possible site for our consideration, please send an email to our Secretary, John Bateman. We will gratefully acknowledge all suggestions. HO and N gauge members are still regularly running trains on our portable layouts installed at member’s houses, and we are attempting to line up a number of social functions. We would like if possible to share our clubroom, when we get it, with other clubs, whether modelling or otherwise. If you have suggestions re other clubs seeking a clubhouse who may be interested in joining with us, please contact Barry Chiswell. Such an arrangement will be beneficial to both parties in terms of funding etc. 2018 is already moving along, and All Gauge is moving quickly to get a new Clubroom following the demolition of the old Clubroom at the Clem Jones Centre. Annual elections were held at the 2018 AGM held on 3 February at the Carina Leagues Club who provided a free meeting room for us. Some 28 financial members turned up at the AGM, and the general feeling was that the new committee of management of seven represented a good cross section of the membership. Almost all of the new committee have had prior experience in the Club’s operations. The Club’s focus this year will be in obtaining a new Clubhouse, and the committee is exploring two options at present. Any suggestions re further options will be gratefully received and pursued. Please contact the Secretary, John Bateman, at johnbateman@optusnet.com.au if you can offer suggestions. Facilities for members to run trains are being regularly provided for HO and N gauge locos, and it is hoped to get the DCC HO layout also made available during the year. A Club functions calendar for the year will shortly be on the website to convince everybody that the Club is very much a live and functioning body. The All Gauge Model Railway Club closed its Carina clubhouse doors on Wednesday 20/12/17. The clubhouse building has now been handed over to the Clem Jones Centre to be demolished. It was a very sad day for our club! The next official meeting of members will be our AGM on 03/02/18 at the Carina Leagues Club. The club is not closing down and we are still looking for a new building. We again ask if anyone has knowledge of a possible site to contact the club secretary at chiswell1936@gmail.com or at the current mail address of 83 Longden St, Coopers Plains, Qld 4108. From the end of December All Gauge will no longer be situated at the Clem Jones Centre at 56 Zahel Street, Carina. Developments at the Centre require us to vacate a building which we have used now for almost 30 years. The Club has been able to demount some of the layouts built with great care over the years and store them. However, much of the permanent layouts will be lost. Although without a Clubroom, the demountable layouts will be stored at member’s homes and will still be available for mounting at model railway shows. The Club is not closing down, but will continue to operate via email, snailmail and phone contacts with members. The next official meeting of members will be the 2018 AGM on Saturday 3 February, venue to be notified. During 2017 we have been actively searching for a new clubhouse with no success at this stage. We would ask anyone who may have knowledge of a possible site to contact the Club Secretary at chiswell1936@gmail.com or at the Club’s current mailing address of 83 Longden St., Coopers Plains, 4108. Our requirements are for a space of roughly 300sq. metres, preferably in the Brisbane City Council area, and preferably south of the river. Please keep in mind that our space will be occupied with permanent layouts. As those of you who were present at our Members Bi-monthly Meeting last Saturday will know, we received a phone call during the meeting advising us that long-time member Barry Williams had passed away on August 14. There had been no funeral service. All of us who come to our club Table Model Train Sales will have their memory of him there in his wheel chair, selling his N scale items. He always did me the courtesy of phoning me to make sure I kept his table for him, a couple of weeks before each sale. He phoned me several weeks ago to say he was in hospital and not to keep his table for the present. I phoned his daughter twice more after that, asking about him and she said he was still in hospital and they didn’t expect him to come home. Maybe those of us who knew Barry should sit and think of him for one silent minute after reading this. Jeff Wilde has sent a card from all of us in the club to the few remaining members of his family. Did You See Our Newspaper Story? Earlier this year The Courier Mail and Quest Newspapers website featured a story and photos on us and our layouts. To read the article just click this line. Replacement of all the light units Upstairs was recently completed. Some units had not been working, others had only a single tube, or none. Some would no longer safely hold their tubes. All the upstairs light units are new doubles with new tubes. The lighting upstairs is now brighter making the layouts easier to see and also making the environment safer, in support of the new Emergency Exit upstairs, as a building inspection had recommended. Importantly, the upstairs lighting Automatic Trigger Unit (which has not worked for some time) was also replaced so that, in the event of an emergency such as a blackout, a light automatically comes on near the Emergency Exit upstairs, near the internal stairs down. A green light unit was also installed over the upstairs Emergency Exit so that exit can be found in the dark. This also remains on in a lighting power failure. Downstairs every light tube, including in the toilet and over the kitchen, was replaced with new tubes. A green light was also installed over the existing downstairs Emergency Exit and it, and the downstairs Auto Trigger Unit, operate in a blackout the same as upstairs. All these Emergency Units have new built-in support batteries. Now, in a total blackout in the clubhouse, the internal stairs have lights top and bottom, and the Emergency Exits green signs remain on. Of course these all operate in a suburban or Brisbane blackout also. As Glen Brown, the club Safety officer often reminds us at Members Meetings, all members and visitors must sign-in on arrival at the clubhouse so that we have a record of those present in the unlikely event of an evacuation. You are reminded that the gathering area in an emergency situation is in the swimming pool car park outside near the rear exit. The All Gauge Model Railway Club Inc has introduced two initiatives to improve the enjoyment of running your trains at your club. Firstly, Amp meters have been installed on the Inner and Outer lines of the HO/OO layout upstairs for members to keep track of the amperage their locos draw. This will allow you to make sure your locos draw less than 2 Amps on each controller as this is the maximum the controllers can deliver without causing overheating and damage to the controller units – such as happened recently when one had to be replaced and sent to be repaired. Single locos should draw between 200 to 350 milliamps with normal running while some Athern models may draw significantly more. Some members have run large double-headed 6 wheel bogie pickup/drive diesels, and maybe another train at the same time on the same line. This is only OK if the total amperage drawn is less than 2 Amps. The meters are scaled as 5 Amp meters where each amp scales in 10 indications to the amp. Therefore, each one 10th of an amp is 100 milliamps as there are 1000 milliamps to the single amp. So the average unit should indicate around 3 & one half on the scale when running “imperial” as indicated on the controllers. If you run the opposite way, as in the “USA” and wherever else they run on the right side of a pair of rails, the meters will register a negative reading. This is not an issue for the meter but if you think you might be overloading the controller, reverse your loco slowly and you should get a positive reading which will represent 80/90% of the negative reading which is occurring with normal running in a “USA” situation. The Watts your unit is using may come up. This is the power (EMF) your unit/s are using and this is calculated simply as Voltage times Amperage = Watts. So, if you are drawing 350 milliamps and the controller is on 10 Volts, you are using 3.5 Watts to drive your unit/s. Not all members are on the Google email system and every member won’t see this notice so please make this a topic of conversation at the club and upstairs while running your trains. Secondly, three of the electric points in the Engine Yard have been brought back to life. It is now possible to run your trains through the Engine Yard’s reverse polarity loop more easily by using the now-electrified points. It is no longer necessary to walk around the yard, to hand-change the points near the time board. A large group of All Gauge members and associates were part of more than 150 family and friends who attended a colourful, lovely Ceremony to mark the passing of one of our Life Members, Joe Parnis this week. It was a sad event of course but there were also some bright and happy moments in the Eulogy delivered by one of his long-term friends, Geoff Horne. And they were typical of many humorous day-to-day things members will always remember about Joe from times sitting around the table at morning tea at the club house and standing beside him upstairs running trains, over the years. It’s a great honour to be asked to give the Eulogy for my friend Joe Parnis, thank you Dianne for the opportunity. I first met Joe some 25 years ago at Archerfield when we were looking at a business venture together. We were both private pilots, we loved classic cars, trains (model and real) and boats. As far as boats were concerned the bigger the better. Joseph John Parnis was born in Malta on the September 7, 1949. In 1954 Joe with his mum and dad, his younger brother Victor, and sister Paulina set sail for a new life in Australia when he was just 5 years old. Interestingly, their family’s arrival in Fremantle WA is recorded on the Welcome Wall of the WA Museum. On arrival in Queensland the family was temporality accommodated at Wacol’s migrant camp and later settled at Narella Street, Cannon Hill. Joe left high school at year 10 to further his studies in Electronics and graduated as an Electronic Technician, specialising in Radio and Television repairs. After leaving high school and while studying he was also the lead guitarist in a rock band! I never heard him play but I’m sure he was great at it; he never did things by half. Joe’s working career was interesting. When researching and listening to others who knew about this aspect of his life I felt a strong affinity with him as he tried so hard over the years to find the right path for his career. Joe was always on the lookout for ways to improve himself. Joe married Kath Nightingale in 1971 and they have two adult children Michael born in 1973 and Michelle in 1975. Joe and Kath have two grandchildren Mitchell and Holly who were very special to Joe. In 1976 the family moved to Manly. Joe’s affinity with all things marine caused them to purchase a beautiful home overlooking the harbour so Joe could check on his boat moored there. In 1987 Joe and Kath separated and later divorced. In 1992 Joe met Diane Wait and they married in 1993. Joe and Di made a dapper couple who enjoyed and made the most of their life together. Diane was indeed the love of Joe’s life. They loved to take their classic cars out for a run spending as much time as they could around all things marine where they breakfasted regularly and checked out the boats in the harbour. • Diane, Wendy and I were in Joe’s hospital room and Wendy and I were just about to leave. I so wanted to talk to and pray for Joe before we left but was not able to do so due to him going in and out of consciousness. I was so disappointed. I was sharing this with Di when I said to this effect “This is Joe’s last chance to re-commit his life to the Lord and we had missed it.” Joe, then hearing the words LAST CHANCE called out LAST CHANCE!!!! We were shocked by this because we thought he couldn’t hear us talking. We all moved to his bedside and I asked him if he wanted to re-commit his life to the Lord. At this stage I was overwhelmed by the moment and Wendy asked him to squeeze her hand if he wanted to. He squeezed her hand so hard that it hurt! We then prayed for him and committed him to the Lord. Wendy and I have lost a great friend far too early. Thank you Joe for being part of our lives. DITTO from the train club mate, DITTO! At the recent AGM (held 13th March 2015 – our 40th!) our club was honoured by its patron Ryan Murphy, Councillor for Doboy Ward, Brisbane City Council. 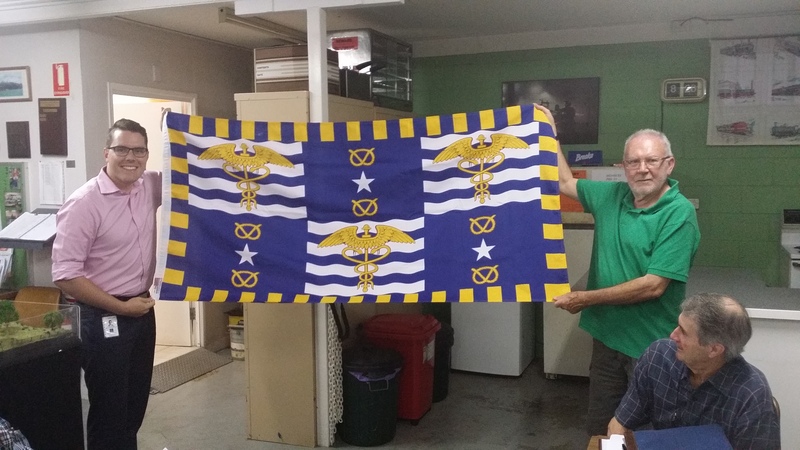 AGMRC Club President Ron Parker was presented with the official Brisbane City Flag. On behalf of all Members, thank you to Councillor Murphy, and here’s to another 40 great years! This article was in the travel section of the U.K’s “The Independent” Newspaper last year. I hope you can open, read and enjoy it. Either click below or copy and paste it in to your menu address. All Gauge Model Railroad Club ( Our 40th Year). The Brisbane Train Show 3rd and 4th of May 2014. This year All Gauge entered 3 Layouts, T-Trak, Endeavour Rail and Bodmin Road. Our Club had an outstanding Show. Bodmin Road received widespread acclaim from members of the public and other Model Train Club members due to its realistic presentation. Full credit goes to Andrew Kreraup and the work he did on the layout before the Show, applying professional weathering techniques coupled with a full refit of the Layouts general presentation, this included more than 200 1/76 scale trees. Bodmin Road was the talk of the show, it looked so life like. It was even heard by several of our Club members that other Model Train Clubs have said that All Gauge has now set the standard of Show Layout presentation. This was evidenced by the Layouts reception by the General Public along with the many verbal and written comments All Gauge has received. Bodmin Road was the most photographed layout of the show. The venue used this year (July 26, 27) was again the Carina Bowls Club part of the Clem Jones Sports Centre. Myself (Andrew Krarup) and Peter Ball managed the Co-ordination roles. Set-up: Alf Petralia, Door Sales – Saturday. Set-up, Pick-up: Dave Austin, Door Sales – Friday, Saturday, Sunday. Bob McCabe, Set-up, Pick-up – Friday, Saturday, Sunday. Road Signs, Show Programme: Ron Parker – pulled together our Show programme at the last minute and placed our Road Signs – Saturday, Sunday. Thanks guys, we know who you are. Peter and I would also like to personally acknowledge our generous sponsors (and their always helpful staff) including Brisbane Lord Mayor, Graham Quirk: Lord Mayor Suburban Initiative Fund; Our club patron Councillor Ryan Murphy (Doboy): Lord Mayor Suburban Initiative Fund; Steve Minnikin MP (Chatsworth); The Clem Jones Sports Club; The Carina Bowls Club; The Carina Leagues Club; Camp/Hill Carina Welfare Association and the Australian Railway Historical Society. And remember everyone, Austral Model Craft, HobbyOne and Railco-Sandgate are your club’s preferred suppliers because they always help us in many ways. Please mention that you saw their adverts in this year’s Train Show program when you visit their shops. Overall a very good Show. Thanks to all involved. 2015 looks to be an even better opportunity provided the venue can be found.